BE was requested to inspect an existing tank that had exhibited signs of deformation for an assessment of its fitness for Service under API (American Petroleum Institute) 579 Fitness for Service. BE performed the Fitness for Service assessment on the tank to determine the structural serviceability and life span. Three-dimensional (3D) scanning utilizing high resolution scanning devices were used to obtain extremely precise measurements. Meshing software was then used to stitch the 3D images together to form a model which was then analyzed in ANSYS Finite Element software. 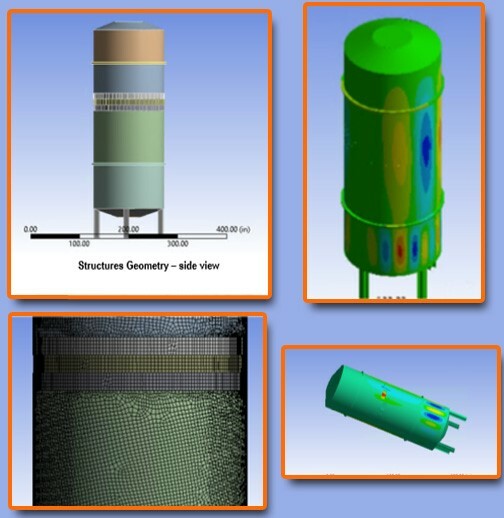 This software analyzes the model for stresses in accordance with applicable codes. When completed, all code requirements were verified and the Fitness for Service (FFS) report was completed, including the anticipated performance under a multitude of environmental, mechanical, and structural scenarios. Accessibility to the equipment was a substantial challenge in this engagement. Not only was this tank surrounded by an abundance of electrical conduit and piping, densely packed structural steel and platforms enveloped the immediate area. When scanning the tank, multiple scanner locations were required to achieve the full aspect and perspective of the equipment. BE’s ability to perform this extremely critical inspection and assessment of potentially compromised equipment and supporting piping systems in a safe, timely manner ensured the continued safe operation in a hazardous operating environment.